We've got lots of new prizes lined up for 'Destroy This Journal' Competition! 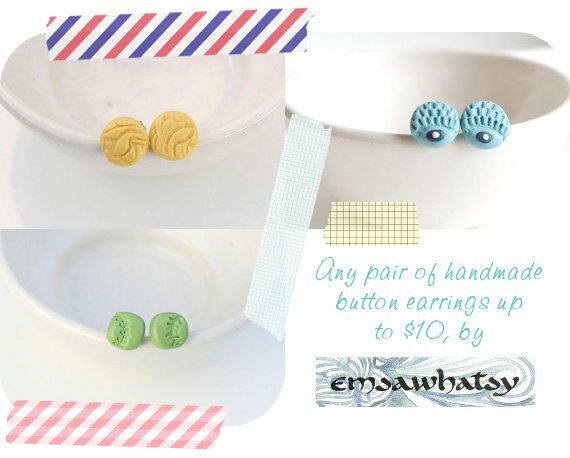 I'll introduce each new prize every week (first come first served), so to kick things off this week, I'll introduce you to Emsawhatsy, who has kindly decided to donate some of her handmade polymer earrings. She's even donating a 30% off coupon as a participational prize! Her shop is full of unique and gorgeous earring designs, all made by hand, of course, and a few paintings and calligraphy cards - I love calligraphy, and briefly had a go myself once. The only one I've done turned out quite well, but for some reason I'm just not confident enough to try it again. I feel I should also let you all know that we don't expect you to fill every single page of the book you choose to destroy. That would probably take quite a long time. By all means, go ahead if you wish, but you could do the bare minimum of 6 or 7 pages, the front cover, and leave it at that. This info has been added to the competition page under "Important Info".